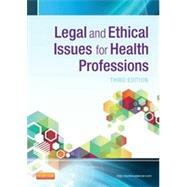 With balanced coverage of both legal and ethical issues, this text provides a foundation for handling common challenges in everyday practice. Real-life examples and case studies help you apply the book's concepts. For easier reading, content is presented in short, concise chunks. Expert author Tonia Aiken shares insights from her years of experience as a nurse, attorney, and public speaker to guide you through issues that may arise in practice, as well as the "danger zones" in clinical situations that could escalate into conflict or dispute. A user-friendly outline format makes information easy to scan. Objectives for each chapter highlight what you are expected to learn and keep you focused on important information. Summaries at the end of every chapter reinforce essential concepts. Study Questions test your knowledge of the material. Recommended Readings list sources for further research. What If? boxes present ethical dilemmas and help you apply concepts from the book to real-life examples. Updated Case Studies discuss the issues faced in a variety of healthcare settings. A revised Imaging Liability and Litigation chapter describes how society holds healthcare workers accountable in the workplace. Important HIPAA information includes the latest privacy guidelines along with ethical and legal implications.